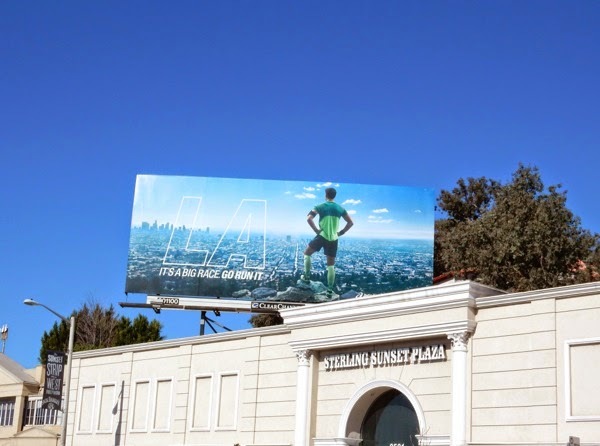 How time flies when you're busy photographing billboards around the busy streets of Los Angeles, as it feels like only yesterday that Daily Billboard was running the 2014 L.A. Marathon in soaring temperatures. Twelve months later and it's time to do it all again, and as luck would have it, this year may be even hotter than last year's record-breaking temperatures, with participants set to face high 80°s heat and possibly higher. 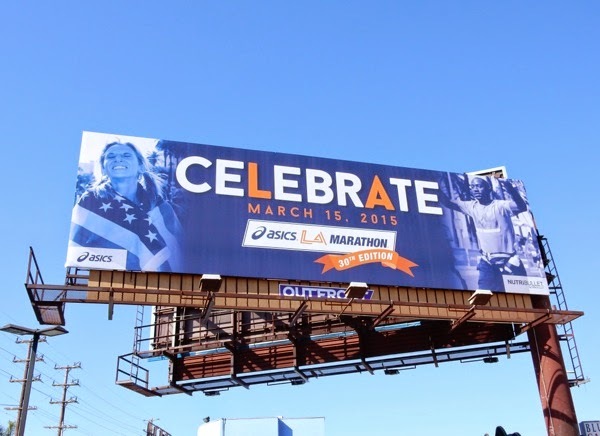 Being a runner, Daily Billboard always enjoys seeing the Asics and official L.A. Marathon billboards popping up in the skies of the city in the run up to the annual event, which celebrates its 30th year today. 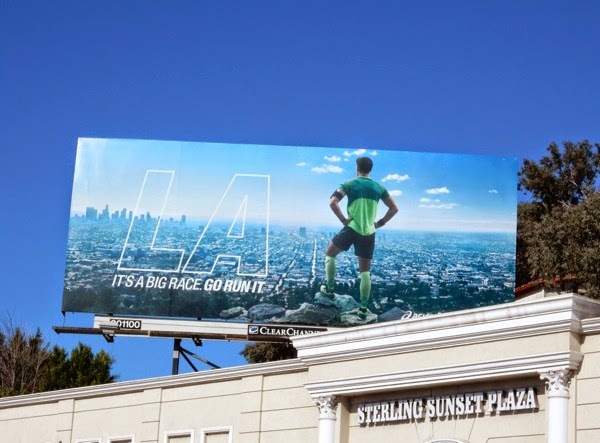 Being the headline sponsor of the big West Coast race, it's no wonder that Asics has tailored its billboard for the local L.A. audience with this fantastic ad creative, featuring a runner in his Asics kit overlooking Downtown and the sprawling cityscape. 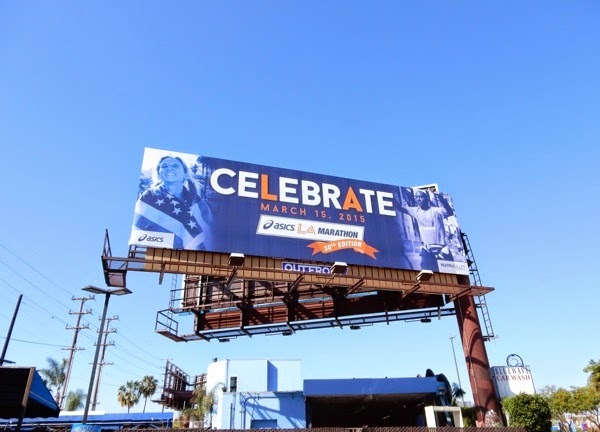 This inspiring Asics L.A. Marathon 2015 billboard was snapped on March 4 along West Hollywood's Sunset Strip just before mile 14, whilst the 'Celebrate' billboard was snapped on March 8, 2015 along Santa Monica Boulevard at around mile 19.5. 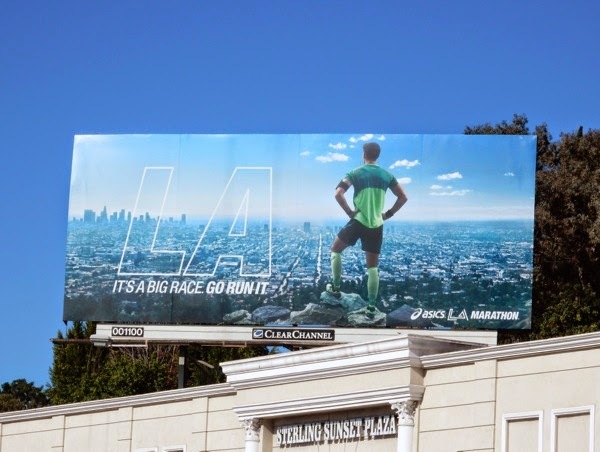 If you like this year's billboards, be sure to also check out these inspirational L.A. Marathon billboards from previous years. Today for our fifth consecutive L.A. Marathon, Daily Billboard will once more be donning our running shoes in support of AIDS Project L.A., to fundraise money to provide essential services for people living with HIV/AIDS, so please consider donating to help this worthwhile cause - DONATE NOW. It's a big race L.A., let's go run it (and may the weather gods be kind).